of ancient populations. The Anthropology Service of Soprintendenza Speciale per i Beni Archeologici di Roma, through its activity of territorial protection, has recorded and preserved a huge amount of useful data over the years, which have been used for the reconstruction of the biological history of Roman society, especially the Imperial Age. 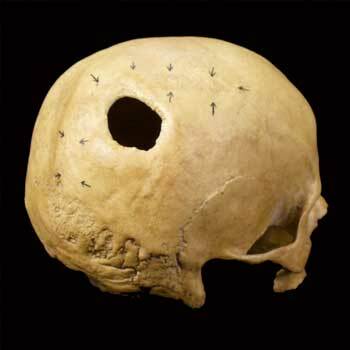 Although new excavation methods applied to human skeletal remains have been crucial for the collection of additional valuable information on Roman tombs, the use of extensive laboratory investigations utterly changed the way to describe the complex biological landscape represented by the ancient Rome. Through the analysis of historical sources, conducted by the Section of History of Medicine Molecolar, Department of Experimental Medicine, “Sapienza” University of Rome, it was possible to be focused on the diseases, and related social events, that affected the population of the City that used to be the largest by far of the Ancient World. In addition, data provided by the paleopathological analysis (in collaboration with the Division of Paleopathology, Department of Translational Research and New Technologies in Medicine, University of Pisa and the Italian Society of Orthopaedics and Traumatology) are integrated with those of the historical and medical sources regarding the course of the diseases and the development of their respective treatments. In this connection, it is extremely interesting to compare the ancient therapies to those applied nowadays, according to the most modern and innovative techniques (which aspect is held to account by the Italian Society of Orthopaedics and Traumatology). The use of biomolecular study was also crucial for obtaining new elements (in progress at the Department of Biology, University of Rome Tor Vergata). In particular the SIA (Stable Isotopes Analysis), by analyzing the carbon and nitrogen ratio in bone collagen, allowed to determine the dietary extent of the individuals. Through an interdisciplinary analysis of samples coming from six different but full of scientific importance necropoleis of Roman Imperial Age, brought to light during the work of preventive archeology conducted by the Soprintendenza Speciale per i Beni Archeologici di Roma, it was possible to establish a real relationship between living conditions, diseases and specific treatments of the community to which they relate. Data reported about the site named Quarto Cappello del Prete are of considerable interest: this area is located in the eastern Suburb, along the Via Prenestina Polense, not too far from the ancient city of Gabii. Moving towards the city center, it is also possible to find the great necropolis Collatina (extending between the Via della Serenissima and the Via Basiliano, near the ancient Via Collatina) and, about 1.5 km far from Porta Maggiore, another funerary complex in the Casal Bertone neighborhood, between the Via Tiburtina and Via Prenestina, adjacent to a structure related to an ancient tannery, named fullonica. Along the Via Tuscolana, very close to the Villa of Settebassi, is located the necropolis of Osteria del Curato. In the South area lies the burial ground of Via Padre Semeria, just off the Via Cristoforo Colombo, close to the southern section of the Aurelian Walls. Finally, in the South-West, not too far from Ostia Antica, on a hilly area has been brought to light the necropolis of Castel Malnome.